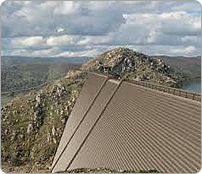 The San Diego County Water Authority (SDCWA), San Vicente Dam Raise is known as the tallest dam raise in the nation. 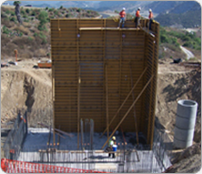 The dam was raised an addition 117 feet, which more than doubles the storage capacity of the reservoir. Constructed in 1943, the dam originally stood 220 feet and stored up to 90,000 acre-feet of water. The dam raise now adds an additional 152,000 acre-feet of water. The project included a surge tank, a pump station, and 11 miles of large-diameter underground pipeline. 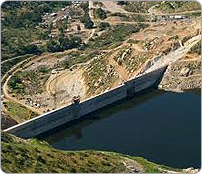 DeltaSE provided programming and system integration services to SDCWA’s HMIs and PLCs for monitoring and control of the dam. The SCADA system is operated by the City of San Diego at their control center. DeltaSE performed electrical and hazard assessments and reviewed single line diagrams for approximately 150 sites for the Calleguas Municipal Water District. Additionally, DeltaSE performed an arc flash analysis, provided hazard labeling, developed a safety manual, and provided safety training for CMWD maintenance staff. This project brought CMWD into compliance with both NFPA 70E Standards, OSHA 1910 Subpart S, OSHA 1926 Subpart K, and fulfilled their need to keep their workers safe around hazardous electrical equipment. DeltaSE provided professional services for an arc flash hazard program for multiple sites throughout Clark County, Nevada. The program included field data collection, an engineered power system model, single line diagrams, short circuit calculations, arc flash analysis, and protection coordination study of each site. 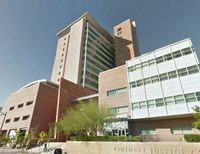 DeltaSE provided assessments and mitigation for over 50 facilities including libraries, court houses, fire stations, parks, parking garages, and other county facilities with hundreds of electric utility service connections. The systems were modeled using the aid of a computer software program and simulated using NEPA 70E and IEEE 1584 equations. DeltaSE also provided hazard labeling and safety training, and a list of recommended repairs to keep county personnel safe while working on and around hazardous electrical equipment. The facility consists of a 1 million gallon reservoir, and dual booster stations, each pumping to separate pressure zones with dedicated hydropneumatic surge tanks. DeltaSE was responsible for the instrumentation, control system, and SCADA system design on this project. Our services included PLC programming of the reservoir level controls, and the two booster station pressure control systems. The control system consists of an Allen-Bradley ControlLogix 5550, and a MicroLogix 1500 for backup pump control. We also configured and programmed a Xycom industrial computer with touch-screen operator interface terminal, running Wonderware Intouch for the human-machine interface. The SCADA system is designed to communicate via radio telemetry with several remote well sites that pump directly to the reservoir. 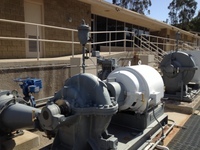 Additionally, a wireless I/O device remotely controls a valve at the golf course irrigation pump station, where potable water can be used to fill the golf course lake. DeltaSE also designed the electrical, instrumentation, and control systems for wells 1, 2, and 4 in the Sundance development, in Buckeye. We programmed Allen Bradley PLCs to control and monitor the wells remotely from the Sundance Reservoir and Booster Station via radio telemetry. The wells can be monitored for run status and alarms. Alarms include the diesel standby generator status. The instrumentation and control system design included flowmetering, which is used to monitor performance of the well pumps. DeltaSE provided the electrical and I&C design for the Phase I and II construction of a new $14.3 million water reclamation facility for the Shea Homes Pleasant Point development, in Peoria, Arizona. The plant’s 12,470-volt primary power distribution system consist of loop fed distribution switches connected to dual 12,470/480 transformer substations, with main-to-main switchgear for redundancy, feeding 480-volt motor control centers and load centers. A 12,470-volt generator provides standby power through a transfer switch connected to the main service entrance equipment. We designed the plant control systems for unattended operation. Packaged systems and Modicon Quantum PLCs communicating to an Intellution iFIX SCADA system control the processes. 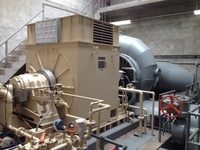 The main plant process areas consist of the headworks influent pump station, screening and grit removal, intermittent cycle reactor, aeration blowers, RAS/WAS pump station, solids handling facility with belt filter presses, traveling bridge filters, UV disinfection, and effluent pump station. Broadband wide-area network connections allow the City to remotely monitor the facility over their SCADA system. DeltaSE also provided system integration programming services during construction, along with shop drawing review, construction observations, and plant startup services. DeltaSE was contracted by the City of Peoria to upgrade their SCADA radio network. 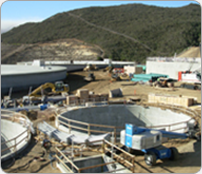 Phase I of this project included a radio path study and detailed inventory for 62 water and wastewater sites. Phase I also included the development of Transition Plans, describing work and materials necessary to upgrade from serial to Ethernet radios, and re-configuration of the network paths to the new Cluster configuration. Phase II of the project is comprised of modification to each of the existing RTU’s PLC programs to accommodate a new Ethernet radio, overseeing the relocation of I/O cards to accommodate the PLC’s Ethernet module, and the reconfiguration of former repeater sites. Programming also included configuration of the Ethernet radios. Programming Services included on-site installation, testing and verification of connectivity. This included overseeing of contractor’s work to include participation in field startup testing, and verification of correct data communication from RTUs to the SCADA. HMI programming consisted of all modifications needed to show added information and verification of correct communication of data from existing RTUs to the SCADA. DeltaSE is performing arc flash hazard analysis and assessment, and implementing an associated safety program for 45 County Facilities. The arc flash assessment and resulting safe working practices are needed to comply with work place safety regulations specified in OSHA and implemented in NFPA 70E as they relate to electrical hazards. More specifically, DeltaSE is providing single line modeling diagrams, a report to include summary, findings, and recommendations for arc flash analysis/assessment, short circuit study, and protective device coordination study for each County facility. Also included is a comprehensive arc flash hazard safety program with basic training of County Facility Operations personnel, generation and installation of required hazard warning labels, proper identification of PPE, and generation of energized electrical work permits.